Gun Control: Maybe they are too young to know, or have faulty memories, but whatever the reason, all those pushing for a ban on “assault weapons” in the wake of the Florida school shooting ignore the fact that the last time the country imposed such a ban it failed to make a measurable difference. Mass shootings didn’t stop during the ban, either — there were 16 while the ban was in effect, which resulted in 237 deaths or injuries. In fact, it was while the ban was in effect that the Columbine High School massacre happened, in which 13 students were killed and 24 injured. 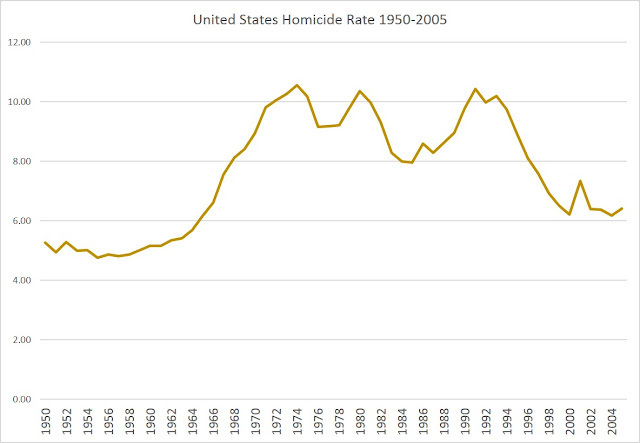 What’s more, gun deaths have steadily declined since 1994, even though the rate of gun ownership has climbed. those who are unconvinced that civilian gun ownership protects against authoritarianism would do well to give the argument some more thought. If well-armed citizens could not defend themselves against the U.S. Army, terrorist groups such as ISIS should have shriveled and died long ago. Instead, the U.S. government has been operating in the Middle East since 1990 trying to stamp out whichever comparatively low-budget terrorist group or rogue state was causing chaos. Still, the United States has not succeeded. If the U.S. government did try to force its citizens into an authoritarian governing system, it would not be wise to use its vast arsenal to bomb cities and destroy infrastructure like it has in places like Raqqa, Syria. The government would be spending money to blow its own assets to pieces. Who would be carrying out the government’s attacks? Many members of the armed forces would be appalled at the idea of unleashing U.S. military force upon their own country–especially an armed country. Although some members of the military would undoubtedly be loyal to an authoritarian government, many would side with the civilians. History provides many examples of an armed populace keeping its government in check. Peter Leeson, a professor of economics and law at George Mason University, contends that the ownership of longbows among non-nobles likely led to the Magna Carta’s final reissue. Once documents establishing universal rights bound the aristocrats and royals, politics became more stable and monarchs abused power less frequently. Society respected the rights of the lower classes much more broadly. Stripping people of self-defense is not only a violation of rights, it spits in the face of America’s own beginnings. The American Revolution itself could not have happened without an armed populace. The U.S. Army was outgunned and often outmaneuvered, but Americans aren’t singing “God Save the Queen” before sporting events because individuals had the agency to protect themselves from an overbearing government. Many more examples of armed civilian resistance to unwanted government authority exist: America’s failure in Vietnam, the 1989 overthrow of Romanian Communist Nicolae Ceausescu, and the ongoing Syrian Civil War, to name a few. The Bielski partisans, a small group of Jewish guerilla World War II fighters, were able to protect more than 1,200 Jews from dying at the hands of the Nazis. The group’s main focus was to protect women, children, and the elderly. The Weimar Republic had disarmed its citizens in 1931, and Adolf Hitler’s party seized power in 1933. It would be foolish to claim an armed German populace would have somehow stunted Hitler’s rise to power, but from their forest headquarters the Bielski partisans were able to run “one of the most successful rescue efforts during the Holocaust,” accordingto the U.S. Memorial Holocaust Museum’s website. That’s obviously a positive benefit to an armed populace. Armed civilians have the power to resist a bad government, and the collective force of millions of armed Americans absolutely acts as a deterrent to increased authoritarianism from its own leaders. If their goal is to keep us safe, then law enforcement and the surveillance state failed at every step of the Parkland shooting. They want us to give up more of our rights based on their complete failure? (No one has yet shown how limiting ownership to law-abiding citizens will stop the actions of those who would break the law and commit the ultimate sin of murder, in a country with 300 million firearms in circulation. The FBI also missed a crucial tip from a caller in January. The person described Mr. Cruz as “mentally ill with violent tendencies,” Mr. Grassley’s office said. The caller said Mr. Cruz mutilated small animals and had pulled a rifle on his late mother, and had threatened more violence. If gun-control advocates want to claim credit for recent declines in homicide rates, they’ll need to explain why they remain blameless for increases in the murder rates that came on the heels of increasing gun controls through much of the 20th century. Of course, in these countries, one could also claim that the lack of sufficiently restrictive gun control was what really caused the increases in homicides mid-century, and that it was the build-up in restrictive laws that finally took effect ten or twenty years ago, thus pushing down homicide rates. However, this could not be applied to the US where gun ownership has expanded in recent years while homicide rates have fallen. Of course, during this period in the United States, gun ownership rates have exploded, with enormous increases in total gun ownership. I examine gun totals here. Meanwhile, the federal “assault” weapons ban expired in 2004 and numerous states greatly expanded their provisions for conceal carry. The Task Force found insufficient evidence to determine the effectiveness of any of the firearms laws or combinations of laws reviewed on violent outcomes. 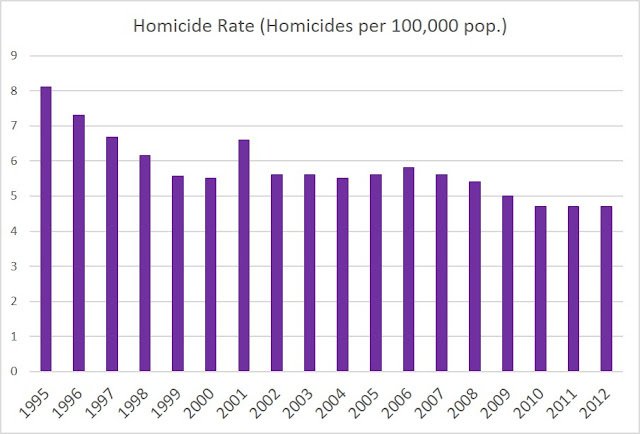 And that was before the continued declines in homicides that occurred during the decade following 2003.